Best Ever Gluten Free Chicken and Dumplings! 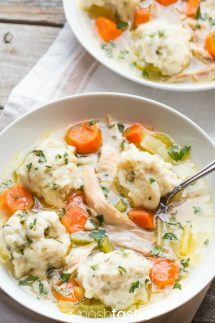 Gluten Free Chicken and Dumplings, its wonderful comfort food and makes an easy weeknight supper! This is on of my kids favorite recipes that they ask me to make over and over again, it’s a classic. I decided to make the chicken broth as I cook it, it’s simply better that was and the taste is far better than if you use canned chicken broth. I prefer to make my own flour blend for this recipe as most of the store bought blends have gum added and they can be overly sticky. However, if all you have is a premade blend that will work too, but making your own is best I think. I prefer to make my own chicken broth by cooking a whole chicken. I use the resulting broth and the cooked chicken for this recipe, it just has a much nicer, fresher, flavor than using ready made chicken broth. While the chicken is cooking I have plenty time to prepare the carrots, onions and celery and then I like to saute them a little in the pan to bring out the natural sweetness. And then once you’ve made the dumplings and the soup is ready to serve, I alway add some fresh parsley to amp up the flavor a little, it’s more than just a garnish! My gluten free dumplings are very simple to make, just add the dry ingredients to a bowl and stir well so that they are all combined. Then you make a little ‘well’ in the middle of the bowl and add the eggs and chicken stock and you’re good to go! I’ve tinkered around with a couple of recipes trying to make dumplings that were soft and tasty and this one works well. I did try to make them egg free (without an egg substitute) and that made a much heavier dumpling, my kids ate it anyway but it was not great. I also wanted to make a dumpling that was dairy free and this one has no milk of any kind in it. You could try it with a flax egg but I’ve never tried it that way so please let me know if that works for you. 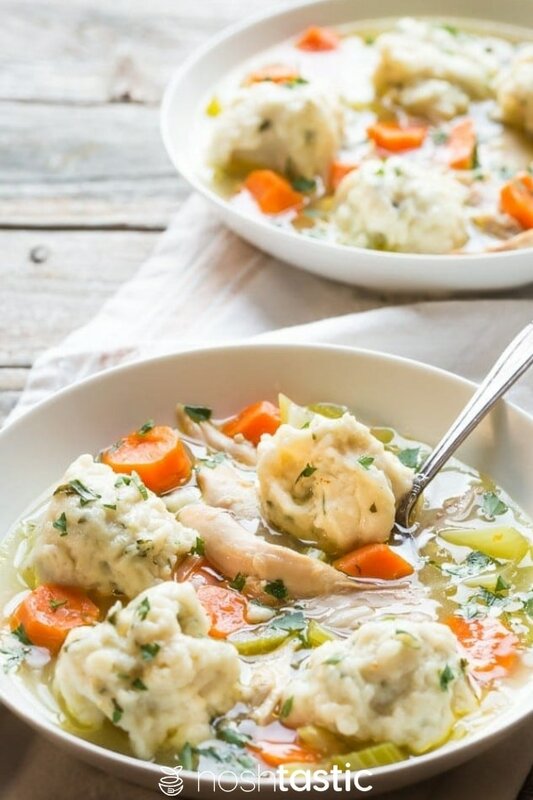 Here are a couple of the ingredients and tools that you’ll need to make Gluten Free Chicken and Dumplings, you make have many of them already. Large Bowl I have one very similar to this in my own kitchen. Bay Leaves – they add a little flavor to the recipe and they are easy to find in any grocery store. Large Pan – As it’s cheaper per pound I’ll often buy a whole chicken (like I did in this recipe) and use that to make chicken broth, but you need to have a large enough stockpot pan to accommodate it. Xanthan Gum – this is a staple ingredient in most gluten free baking and flour recipes, it helps to hold the flour together in the absence of gluten. Most premixed gluten free flour blends already have Xanthan gum (or a similar gum) added so be sure to read the label. Sharp Kitchen Knife – Everyone needs at least one all round sharp kitchen knife, this is very similar to the one I use. Cutting Board Set – I love a great cutting board set that comes in various sizes and you can throw in the dishwasher, win win! PIN THIS TO YOUR GLUTEN FREE DINNERS BOARD! 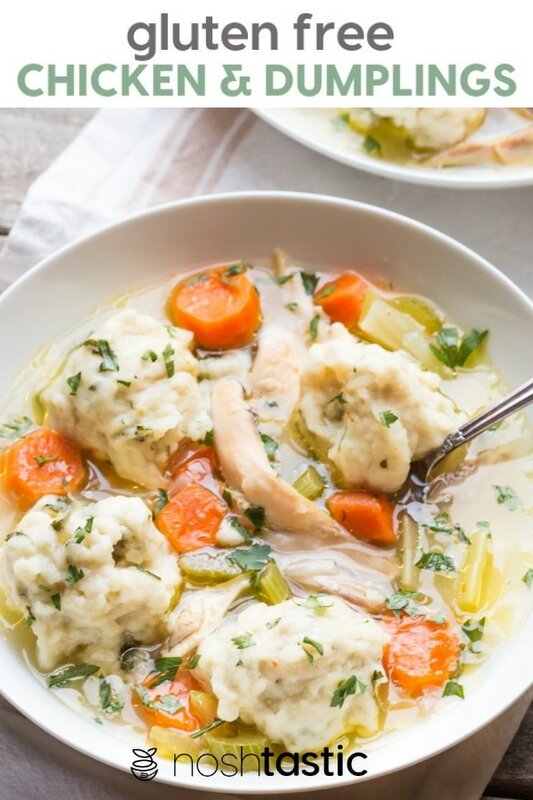 Gluten Free Chicken and Dumplings, perfect weeknight comfort food! Put the whole chicken in a large pan and cover with water and add the bay leaves. It will take about six to eight cups of water to cover the chicken. Bring the pot to the boil and then simmer with the lid on for about an hour, you can skim off the foam and scum from the top of the water as you go. While the soup is simmering prepare the onion, carrots and celery as directed. After the chicken has been cooking for about 50 minutes heat the oil in a second pan (large enough to accommodate the soup) and gently saute the onion, carrots and celery for about five minutes. Add the broth from the chicken to the pan with the vegetables and let it simmer on a medium heat for a few minutes. When the chicken has cooled enough to handle, peel the skin off and tear the meat off the bones and add it to the soup, then season with salt and pepper. To make the dumplings add the dry ingredients to a bowl, then add in the beaten eggs, parsley and chicken broth and mix well. The dumpling mixture will be thick and sticky, drop even sized spoonfuls of it into the pan with the soup. Cover the soup and simmer for 20 minutes. Taste the soup and season, garnish with chopped parsley and serve. 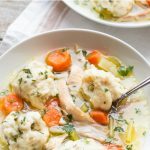 Chicken and Dumplings is one of the things I haven’t attempted to make, I love that this version is gluten free! It looks incredible, i understand why your boys gobbled it up! Thanks Krista, I hadn’t made it in a long time either but it’s now one of our favorites! Great recipe and gorgeous photos!! Wow! Your gluten free recipes are AMAZING! I am sending every celiac I know your way. Oh boy this looks terrific. I can’t wait to start making soups! Wow just pass me the whole bowl(s), please! That sounds delicious!! Gluten free or not, I’m comin’ to get it! This is gorgeous Sheena! You are a very talented lady and this looks fantastic! Pinned, stumbled and Yummed! This soup looks amazing! I can’t wait to make it. Since my husband is gluten-free now, I am excited to try making the gluten free dumplings! Quick question: I got an all-purpose gluten-free flour that says it is 1:1 and already has xantham gum. Can I use 2 cups of that and leave out the xantham gum? What is your opinion? I made this dish for dinner tonight and my family loved it! I used skinless, boneless chicken thighs so it was much faster to cook: 15-20 for the chicken, 20 minutes for the dumpling, and another 10 minutes of simmering after the chicken was shredded and added back into soup, for a total of about 50 minutes of cooking time. It came out great. Hi Lynda! So glad your family loved it and you found a way to do it with chicken thighs! 🙂 It’s a favorite round here too, I need to make it again soon! The soup was fabulous! We added thyme and a lot of black pepper. The dumplings were quite dense and sticky inside, even with a longer cooking time. Any ideas where we went wrong? They held together great, looked great, smell great, but the texture was off. New to gluten free; am I just expecting too much? Most gluten free products are never quite as delish as I hope them to be. Thanks so much for the recipe, will try again for sure! Hi Heather, I made and tweaked this recipe about five or six times before I posted it because I was trying to get super fluffy dumplings, I tried it without eggs and they were even more dense than without. You are correct, the texture for some gluten free food made with GF flour is just never going to be the exactly the same and so the GF dumplings are more always going to be dense than their gluteny cousins. And I’m with you on the ready made gluten free baked products, they are usually a bit of a disappointment so that’s why I typically make my own, so if you’ve not tried any of my baking recipes you might want to give them a go! This recipe is excellent. It is the perfect comfort food! This dish looks so amazing I could jump in right now. I’ve got my spoon ready for this yumminess! Thanks KC, it’s very yummy! Can I make it without the Xanthan gum? I have gluten free flour from Aldi. Hi Joy! Sadly we don’t have an Aldi’s where I live in Mississippi but I am familiar with the store from Scotland. If it’s the Aldi’s Gluten Free Baking Mix from what I found on the internet I *think* that it already has Xanthan gum added in the mix, it should tell you on the label though. If your mix does not have any kind of gum added I can’t be sure but I think it might still be ok for the dumplings because of the eggs in the recipe. If you don’t have gum (or something else to replace gluten) in oven baked gluten free goods they can often be very crumbly, but because the dumplings are cooked in the soup I think they may be ok without gum but I can’t say for sure as I’ve not made them that way! How do I get your newletter. Hi Pat, I have it in a pop up but as I just changed some things on my site last week I have yet to add it in elsewhere. I have added you manually and so if you still want to subscribe just reply to the email link, if not just ignore it. I hope this helps! I have a son that has an egg allergy as well as egg and wheat allergies. I haven’t been able to find a good recipe for dumplings that excludes all of these items. Do you have any experience with substituting eggs? I usually use a flax egg, but I don’t think that will sound good for dumplings. Hi Kristin, I know it’s hard to have a child with multiple food issues, my Celiac son is also allergic to tree nuts. In answer to your question, I made these dumplings a couple of times and I did try them without egg (I didn’t replace the eggs, just left them out) and they were passable but heavier than the dumplings made with eggs, my son ate them anyway 🙂 . As we can eat eggs I don’t typically substitute them so I’m just not sure how flax or any of the other replacers will work for this. Could you freeze this at all? What might need to be cooked ahead of time before freezing? Hi Kelly, I think it would freeze ok if it’s all fully cooked. I know the soup part would be just fine, not 100% sure on the dumplings but I think they would be ok too. I plan on making this recipe today for the first time & wanted to know if step 6 is written correctly. It just says “garnish”. Can you elaborate? Thank you for posting a recipe, using fresh vegetables. Looking forward to making this. I made this twice! Absolutely love it. The dumplings were a little wet for my taste after 20 minutes so I uncovered them and cooked another 10-15 minutes. That was better for me. I also replaced part of the parsley with thyme. Thank you for a delicious recipe. It’s a rainy MN evening here and dinner is pure comfort food tonight. So glad you liked it Jeanne! I’m wishing for some of your cool MN weather here in MS, it’s still summer weather. Could you make this in a crockpot? If so how would the recipe change if at all? New to GF cooking and Crockpot cooking. Hi Monica! I’m for sure not an expert in crockpot cooking and I’ve never cooked a whole chicken in there so I’m not sure if it’s possible. If you google ‘how to make chicken stock in a slow cooker’ that might give you an idea of whether you can do the first part and what the timings would be. For the part where you make the soup and dumplings, I would think it would take a couple of hours on the low setting, I hope this helps! I am wondering if I could use collagen instead of the gum? Hi Jasi, I’ve never cooked with collagen and have no idea if it would work or not. The recipe sounds absolutely delicious. I follow the Wahls Protocol a diet to reverse chronic autoimmune disease so I do try to stay gluten-free at all times. Unfortunatly I love dumplings but can’t find a source of good gluten-free flour. Hi Stephen, Thank you for your kind words about the recipe. I hope your health improves, I know that’s so hard to deal with. I am just making this recipe for the first time today and will rate it later. Title concerned about how my dumplings would turn out, so he refrigerated mine for about 30 minutes before adding to the broth. Covered and cooked for about an hour in the broth before adding in the chicken which keep the chicken from getting string. My favorite! Thank you so much for this recipe! Red Mill brand is very good. You can purchase any of their products on Amazon if you can’t find it in your local stores!. I also have chronic autoimmune diseases and empathize with you! Made the dumplings to go with beef stew. So tasty & easy!! I use a bit of garbanzo flour in with my gluten free flour mix. The dough tastes funny but that dissipates in the finished product. It does make things a little fluffier. How well does your GF flour recipe work for these dumplings? I used it yesterday to make your lemon bars and they were fantastic! Hi Hayke! I’m so glad you liked the Lemon Bars! Yes, it should work for the dumplings, they work best with a blend that doesn’t already have gum added as they can get super sticky otherwise. Hi Amy, I know FODMAPS is very tricky so I’m glad this worked for you. My son is the same, I don’t believe he’s ever had regular chicken and dumplings and this is one of his favorites! Hi Lisa, there’s no dairy in this recipe. I have left over cooked chicken from a store bought roasted chicken. I know it would of been much more flavorful with the whole thing but since I don’t have the whole chicken how much chicken broth would I use for the base of the soup? Hi, I used about 8 cups of water to make the homemade broth but some would evaporate during cooking so try with 6 cups and add more if you need to. Step one says to cover with water and then add bay leaf and add 6-8 cups of water. Does this mean more water or just 6-8 cups? My apologies, I’ve updated the post (you may need to refresh the page) to make the directions clearer. You need to cover the chicken with water which will be approximately 6-8 cups depending on the size of your pan. Thanks so much. I am making this for supper. Hi Shari, I’d think they would need some other binding agent instead, I’m not confident they would hold together otherwise. I have some GF blogger friends who use a little ground flax seeds with hot water to make a sticky paste and use that instead of xanthan gum in baking, but I’m not sure how much to use so maybe have a google around and see how much is generally used per 1 cup of gluten free flour. This recipe was great! I used Namaste Foods GF flour from Costco. My only issue was that the dumplings always turn out larger than I personally like, so I have to remember to make smaller “dollops” because they plump up! I also subbed some thyme for the bay leaf because I never seen to have bay leaves around…. Looks delish!! I too have many food restrictions and being older makes it even more difficult to find recipes that taste just like you remember foods tasting while growing up. After 15 plus years (and still adjusting) of adding to my list of food restrictions it gets frustrating when grocery shopping and meal planning. THANK YOU for sharing your hard work and delish Recipes!!!!!!!!! I can’t wait to try them all ???? Thank you Geralyn! I hope you enjoy this recipe! Made this tonight with gluten-free flour from Bob’s Red Mill that had Garbonzo bean flour. The taste of the dumplings was acceptable, but the broth was amazing. I did add some thyme & sage to the dumpling dough, but wish I had added more. Smaller dumplings actually worked a little better. Thank you so much for posting what looks like an amazing recipe. its so difficult to find dairy free recipes that are delicious. this looks wonderful. thank you, thank you! you’re so welcome Elizabeth, I hope you enjoy it! I followed the recipe and I’m not sure what went wrong. My dumplings ended up more like grits. I used pilsbury gluten free all purpose flour and it has the gum in it. Any ideas why this might have happened? it’s hard for me to tell what might have gone wrong but I’m wondering if you mis-measured and didn’t realise (either too much liquid, or not enough flour) something along the way as the consistency of the dumplings should not even be close to runny like grits. Could you put extra flour on this and roll it out to make cut dumplings? Hi Linda, I’m not familiar with those sorts of dumplings so I’m honestly not sure if that would work or not. Yay! Somewhere to get gluten free recipes. I would love any recipes you can share with me. My allergies are wheat,egg yolk and sea food. I’m very excited to discover your website I’m fixing to go to it. Hi Janet, thanks for visiting. If you use the recipe menus at the top of the page (this is easier on a computer, but a phone works too) choose the ‘Gluten Free’ option and then you can select the ‘egg free’ option in the menu, I hope that helps! Great winter soup. Very satisfying. I love dumplings, my husband not so much so next time I will add some savory herbs to the dumplings for a bit more flavour. Is definitely in my saved file. Hubby is a soup connoisseur and gave this recipe a big approval rating. Sheena, this is really a great recipe. I will make this at the next chance i get. I really want to make this for my gluten-free and dairy free friend, but none of the stores near me sell xantham gum or flour with it. Is it possible to use almond or coconut flour? What a kind friend you are! I don’t think it will work without the gum, and nut flours are not interchangeable with gluten free flours. Your best bet would be to find a quality gluten free flour blend and try that though it may produce a gummier result as the premixed flours have gum added already and it’s hard to know how much is in there, but that would be a much better bet than using nut flours. Failing that, you can order them all on Amazon, but that’s a bit of an expense if you are only cooking for her occasionally, good luck!